Have fun with lots of creative options as you design your own skirt for your 14-14.5 inch doll. This quick and easy skirt PDF pattern features elastic enclosed in the facing from the back of the skirt and ending at the front panel. 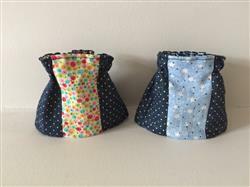 It can be made with or without pockets, with or without trim or ruffles, with or without buttons, etc. in many combinations of fabric colors and prints. Mix and match coordinating fat quarters to make lots of fun looks. Make your skirt preppy, dressy, or casual. 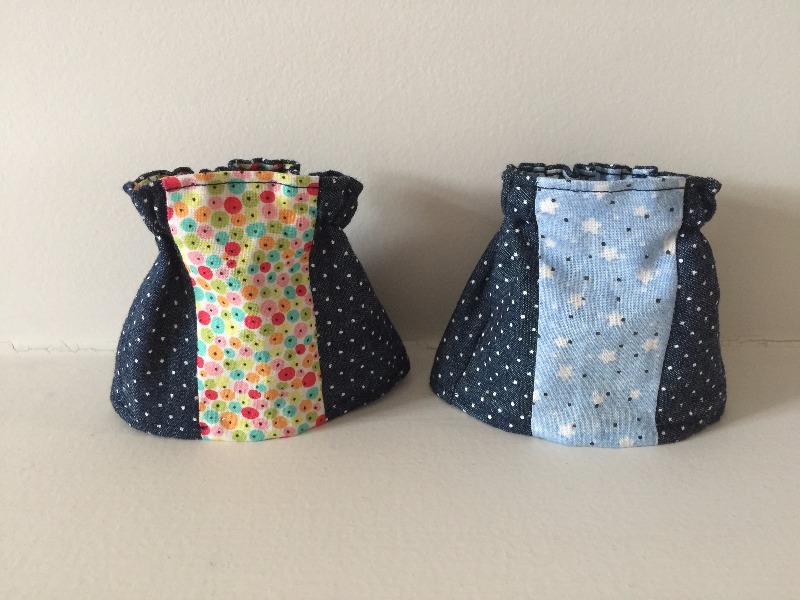 Make a group of these little skirts to use as party favors for a special child's birthday party. The options to be creative are endless! This pattern will fit 14-14.5 inch dolls such as Hearts For Hearts and WellieWishers. It is also available on Pixie Faire for 18" dolls such as American Girl. Recommended Fabrics: Lightweight woven fabric such as quilting cotton, lightweight denim, lightweight twill, etc. I really liked this pattern. I made it up for the Corolle Les Cheries as the waist etc measurements seemed ok, and for this first time I didn't make a fancy trim but used a contrasting fabric for the front panel on each (I have 2 granddaughters with a doll each!) It was nice and easy to cut out and sew - and the elastic went in well. I will be using it again once I have seen the skirts on the dolls and know if I should make any more alterations in the pattern sizing. And look forward to experimenting with different trims. So cute, sky's the limit on design! I got to test this pattern and it really goes together nicely. I did a quick, non trimmed version but am anxious to try some of the different trims suggested. There are so many possibilities! It fits really nicely too.